According to the 1962 Missal of St. John XXIII the Extraordinary Form of the Roman Rite, today is the feast of St. Simeon, bishop and martyr. He was successor to the apostle St. James in the See of Jerusalem and was arrested and probably crucified in about A.D. 110, under the emperor Trajan. He ruled over the Church of Jerusalem for forty years. Historically today is also the feast of St. Flavian of Constantinople, Patriarch of Constantinople and martyr of the 5th century. A blood relative of Christ, he was martyred in early apostolic times. Succeeding the apostle James, Simeon, the son of Cleophas, was, it may be said, the first bishop of Jerusalem. Under the Emperor Trajan he was arraigned before Atticus, the governor, on charges of being a Christian and a relative of Jesus. For at a certain period, all descendants of David were apprehended. After enduring all types of torture, he was affixed to a cross, even as His Savior. Those present marveled how a man of such advanced age (he was 120 years old) could so steadfastly and joyously bear the excruciating pains of crucifixion. He died on the 18th of February, 106 A.D. The siege and the destruction of Jerusalem took place during his episcopacy. 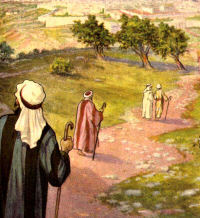 He accompanied the Christian community to Pella. In the spirit of the blind man in today's Gospel and mindful of St. Simeon's joy upon his martyrdom, pray for vision to see the Crucified Christ in all your struggles. Saint Josemaria Escriva recommends that the serious Christian carry with him a small crucifix, which he may keep before himself at all times. In your case, this may be the kitchen, the office, the classroom, or any place in which you are fulfilling your duties. When it becomes difficult to persevere, look upon Christ and be reminded of the value of your small trials. Read this account of the martyrdom of St. Simeon by St. Eusebius of Caesarea. If you are interested in genealogy you might like to read about the genealogy of Christ at New Advent. 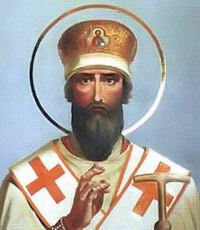 St. Flavian was patriarch of Constantinople, and he was hated by the Emperor Theodosius II's chancellor, partly because he would not give Church money to the Emperor. In 448, St. Flavian held a synod that condemned the abbot Eutyches for denying that Jesus Christ had two distinct natures, a denial that was the beginning of the Monophysite heresy. Eutyches then appealed to Pope St. Leo I, but the Pope sustained the decision and wrote his famous "Leo's Tome" to St. Flavian, a letter expounding the orthodox position on the matter. The Emperor called another council at Ephesus in 449, which St. Leo later called a "robber synod." Conducted in open violence, it unjustly deposed St. Flavian and Eusebius, Eutyches' accuser in 448. St. Flavian was beaten so severely that he died days later in his place of exile. In 451 the Council of Chalcedon vindicated St. Flavian, reinstated Eusebius and exiled the Bishop of Alexandria, who had supported the heresy. St. Pulcheria had St. Flavian's body brought back to Constantinople and buried with those of his predecessors. Read more about St. Flavian at EWTN.